History Under Luftwaffe General’s cape closure. Categories: Belt Buckle & Fieldgear, German, Uniforms. Ultra difficult to obtain! This is the 1937 General’s pattern made from gold anodized aluminium. All prongs are present, only missing the round metal disc that would act as a stiffener when being worn. These are also referred to in traditional circles as a “Spanierschoss” or Spanish buckle. Lower grade officer’s wore a silver Spanish buckle. Excellent condition. Rare matching set of Heer (Army) Field Post shoulder boards. 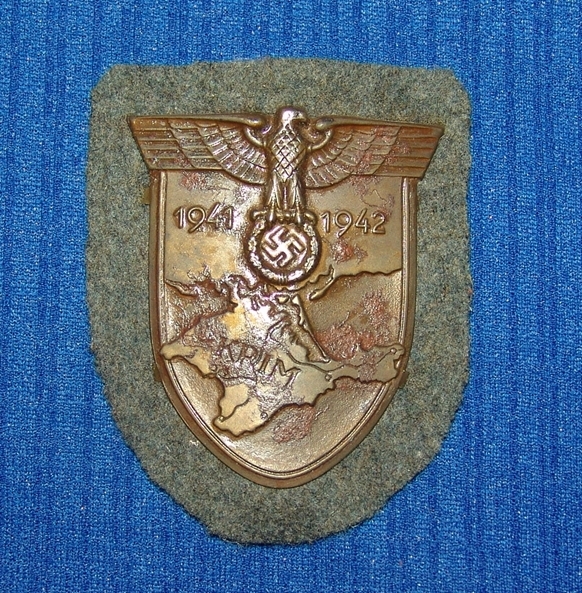 Army/Waffen SS Krim Campaign Shield.